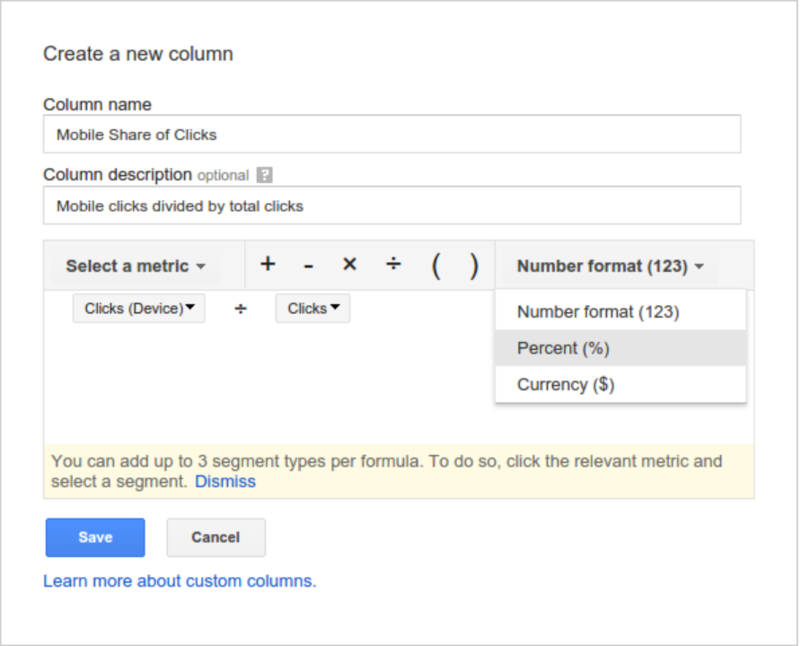 Google AdWords quietly announced on Google+ that the custom columns now let you do custom formulas in those columns. This means you can add computations like addition, subtraction and multiplication directly in your AdWords custom columns. Now when you create custom columns, in addition to specifying custom segmentations for your metrics, you can apply formulas for those metrics. For example, to see the percentage of clicks you get from mobile devices, create a custom column that divides mobile clicks by total clicks. Or let's say you’re a shoe retailer and enjoy a 40% profit margin for each pair of shoes you sell. To understand your total profit for each sale, ensure your conversion value column tracks revenue. Then, create a custom column that multiplies conversion value by 40% and call it “Estimated Profit.” As always, you can still sort, chart, filter and download your custom columns, as well as include them in reports and automated rules. For more on this, see this help document.